Orval is a beer that's a big inspiration for me and a lot of others I'm sure. It's a pillar in what used to be a very "weird" group of beers. Go back to somewhere like 2010 and there was limited information readily accessible about brettanomyces. You had to dig into forums and sometimes venture into the dark places of the internet. Go back a little further and I bet there weren't many people who had ever heard the term. 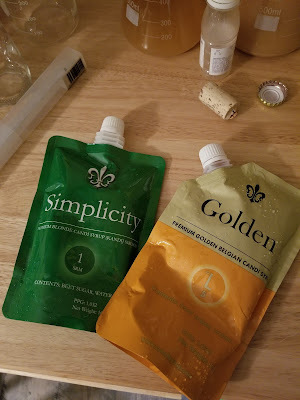 I'm sure folks in the wine industry and long time sour beer producers sure knew what it was but for the regular every day craft beer fan and homebrewer, it wasn't commonplace. But... We had Orval. 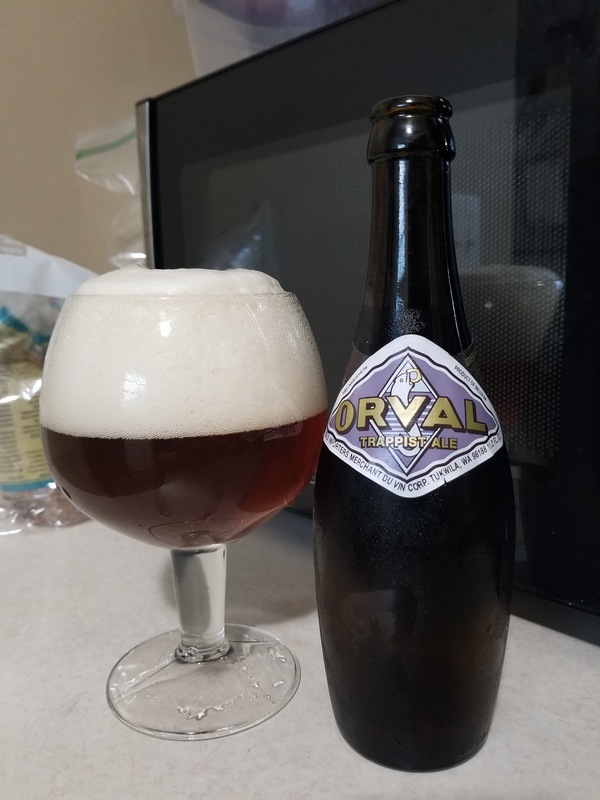 Orval started showing up here in Mississippi right after the laws changed in 2012 to allow for beer over 6.2% ABV to be sold in the state. My craft beer obsession began around 2009 or so and I had Orval at some point before it showed up in the state. To this day, I always have a few bottles of this wonderfully weird beer on hand. OK all that said, what does it taste like? Why do people love this beer? Well that's another interesting aspect of this one. Since it has brett and is dry hopped it changes a good bit over time. It evolves into different beers all together. Fresh it is quite bitter, has awesome floral hoppy notes with a bit of spice from the yeast and just a hint of brett character in the form of what I would describe fresh wood and citrus fruit. 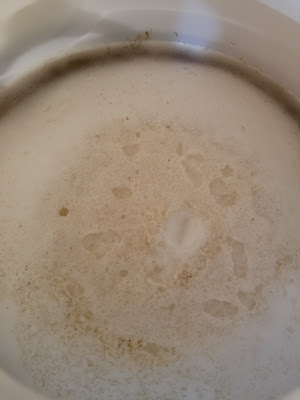 After about 6 months, the dry hop tends to fade and you'll get more of the Belgian yeast character that has a slight bit of acidity to it and some ripe fruits. The brett character really starts to kick up about a year in and you'll have something completely different than the beer was fresh. So that brings us to this post. "Inspired Beer" is something I've been wanting to do for a while now. Rather than actually try to clone a beer, I'd rather take inspiration from it and make something my own with a similar process. Orval is just the first beer I wanted to write about. It's a dry hopped, brett finished, Trappist beer. So different from what the other Trappist breweries produce. Using their website, reading different books and looking over the internet, below is the recipe I've come up with using inspiration from the original. *Side Note: There used to be a beer brewed by Green Flash called Rayon Vert that was a take on Orval. I liked that beer a lot too. It has since been discontinued by them and I drank my last bottle of that sometime in the last year or two. It was still awesome. If you've ever been interested, you can find out a lot of how Orval is made straight from the source here. Batch: Honestly, I've lost count and not really worried what batch number I'm on now. 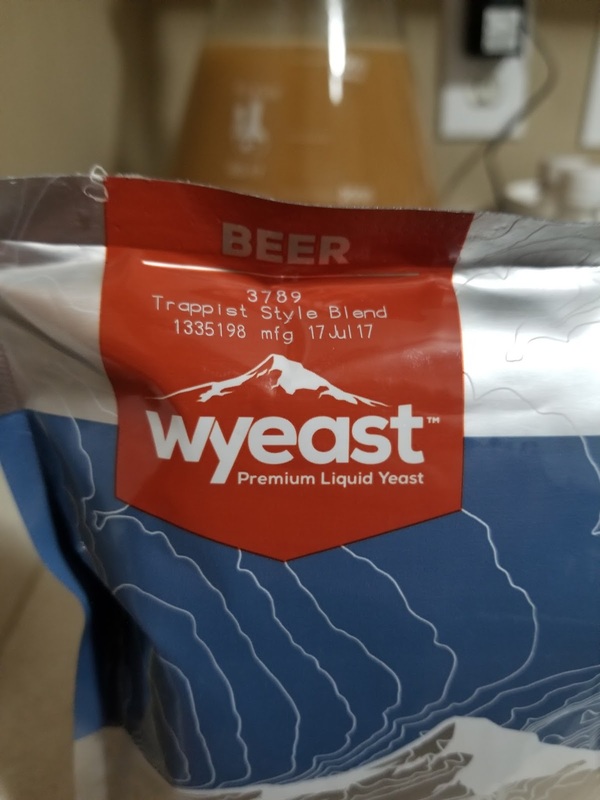 Wyeast Trappist Style Blend 3789-PC - Private Collection release for Summer 2017. A Belgian Trappist yeast strain and a strain of Brettanomyces in one pitch. Pretty sure this was made to emulate Orval even though Orval adds Brettanomyces after primary fermentation. I found this Orval step mash here. 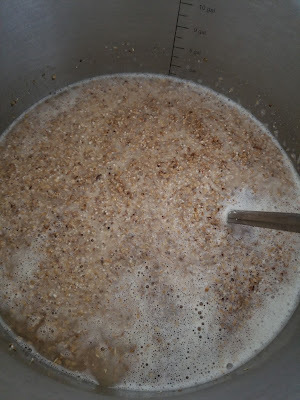 Ferment at room temperature (70-74F) until FG is achieved. 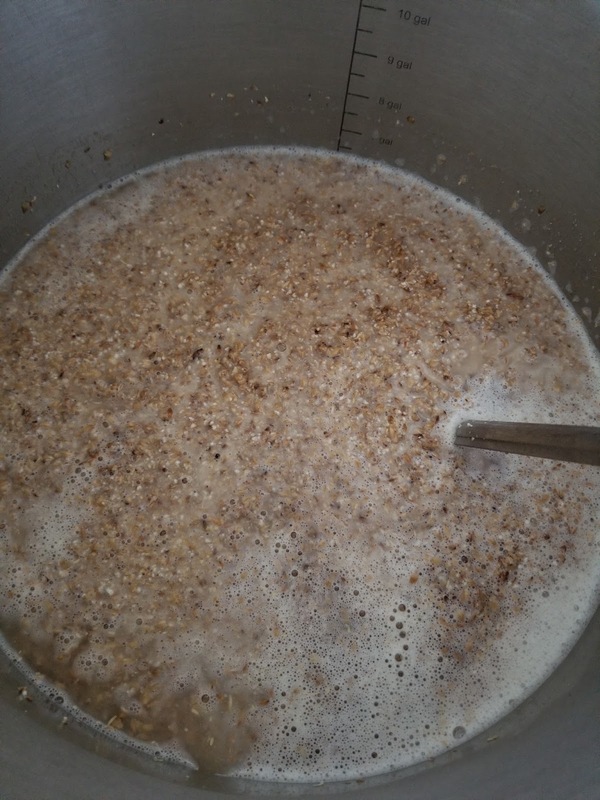 Ideally you'd probably want to use a Belgian pale ale malt but I have Maris Otter on hand so I used that. Some classic flavoring hops and I'll be using Hallertau Blanc for dry hopping. I'm interested to see how this plays with the Belgian yeast and brettanomyces. I really like this hop in Saison so we'll see how it does here. This was a rather long brew day. The mash schedule was pretty step intensive but it really paid off in efficiency. My target pre boil gravity was 7.6 brix (1.030 SG) and I actually hit 8.6 brix (1.035 SG). After the 90 minute boil and adding in my sugar I ended up with 14.2 brix. I didn't use all of the Golden Candi Syrup as I was wanting to stay under 14.5 brix (1.059 SG). water but I'll fix my efficiency in BeerSmith. 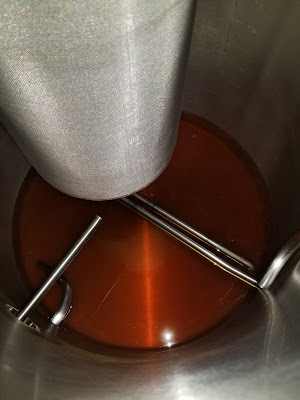 First runnings were a beautiful amber color. Two different Belgian Candi Syrups in this one. After the boil I cooled the wort down to 65F with my plate chiller and pitched the Smack Pack. It wasn't extremely fresh but it did swell completely after about 4 hours. When it reaches a stable final gravity, I'll dry hop and package this up. I'm really interested how the brett and dry hops work in this one. Be on the look out for more "Inspired Beer" posts. I've got a few ideas lined up. Let me know what beers have inspired you along the way! 10-22-17: Morning after we already had a nice krausen forming. 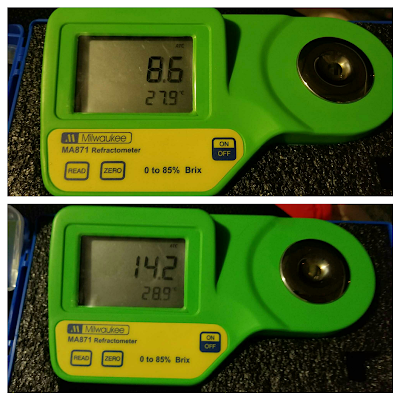 6-11-18: Dry hopped with 2oz Aramis. I really liked the aroma on these and thought they would pair well. Will package soon.